I found this recipe the other day via SparkPeople.com. I am trying to get my family and I to eat more healthier foods so now I am on the look out for recipes that I know everyone in the family will eat. I made this two days ago and it was so good. 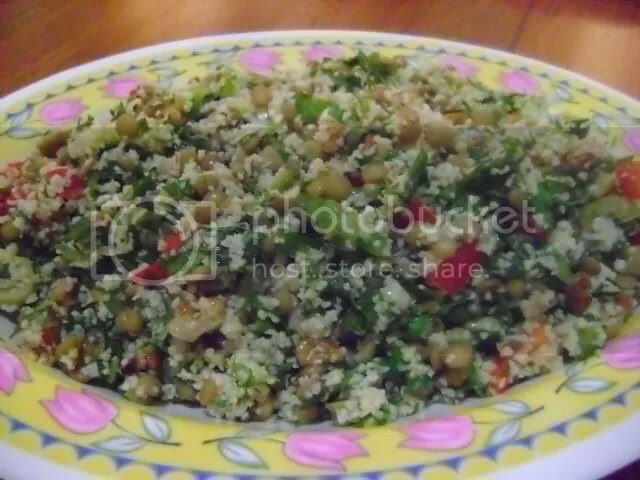 It is like a tabbouli salad but with more fresh herbs, and the addition of brown lentils, a little more veggies, and some walnuts. My husband and I really liked the salad…the kiddos…well three out of four ate it and liked it. I will definitely make it again. Wash and rinse the brown lentils. Add to a pot with the 2 cups of water. Partially cover and cook for 20 minutes. Drain and place into a large bowl. While the lentils are cooking, soak the bulghur wheat in a bowl with the 2 cups of boiling water. When the lentils are done cooking drain and remove as much of the water from the bulghur and then add to the lentils. In a small frying pan, heat the olive oil and add the minced garlic. Cook for just a couple of seconds and then add to the lentils and bulghur. Add the remaining ingredients, except for the feta cheese and tomato, and then add salt and pepper to taste. I really don’t think it needs additional salt because of the olives. The tomatoes and feta will be used to top the salad when you serve it. Just put about a tablespoon of the feta cheese on top of the salad and as much as the chopped tomatoes as you want. Yummm, this is just soooo good! I am going to make some more for lunch today! Oh, and I want to add that this would go really well with some grilled chicken breast.